Air Flight Charters says: “I’ll trade you my M&Ms for a beer” … says my fishing partner. I merely grunt disapproval. He responds, “Yep, I know, not a fair trade…”. Not to abandon him, I offer “You got 10 minutes to land a fish, and the beer is yours.” I’m feeling very confident like holding a full house Aces over Kings ~ it’s slack tide and not a Bonefish in sight. Then I learned a whole new meaning of #game. Doug jumps on the casting platform with the grace and speed of a cheetah, and Sean starts poling our skiff nimbly through the mangroves like a 911 Porsche in stealth mode. I started sweating. With X-Ray vision rivaling Superman’s, Sean called out “I got a fish”. My stomach sank. The wind kicked in. Mangroves were scattered everywhere. The cast would be like trying to hit a small green at 200 yards surrounded by sand traps. I took a breath of air. Only one. I saw the rod lift followed by the whisper of fly line through the air and an impossibly tight loop that could fit through a coin slot at the arcade cut through the air like butter. Time slowed. Strip – Pause – Strip. The line tightens. Strip set. The rod lifts and the slack runs to the reel. The fish takes a hard turn towards the mangroves and starts peeling off line. Expletives come from the front. I smile. Doug counters nimbly, rolling the rod tip down to the water and hauling the opposite direction. 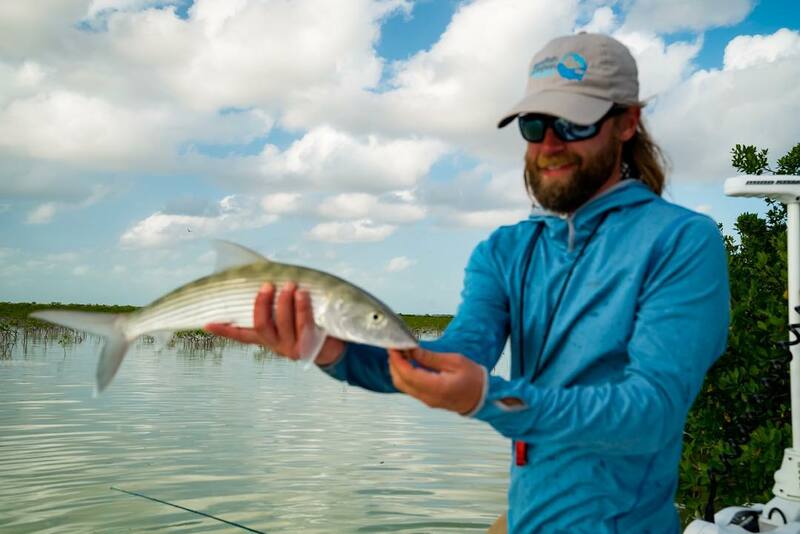 The Bonefish has no choice but to comply. It was Doug’s turn to smile. . Simply the truth ~ thanks!! M&Ms did it again. Thanks captain, I hope we have this same crew next fall!